Classic in style and design, our Terra Cotta quilted bedding is a beautiful rustic "burnt orange" color. 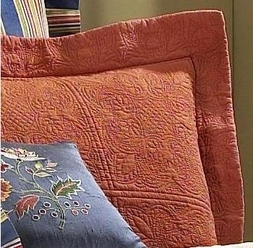 Matelasse is a French term for "quilted ornamental fabric" with intricate stitching. Shams have a 3-inch flange edge.